This week I wanted to bring to every business owner’s attention the IRC Section 179D deduction. For those who may have never heard of this part of the tax code, the Energy Efficient Commercial Buildings Tax Deduction under IRC Section 179D was enacted as part of the Energy Policy Act of 2005. The law was passed to encourage building owners to increase the energy efficiency in their buildings by allowing for an immediate tax deduction. What Qualifies for the Deduction? The 179D deduction is allowed for Qualifying Building Property (“QBP”). QBP includes property installed on or in any building located in the United States of America and falls into any one of three main categories: interior lighting, building envelope, or heating/cooling/ventilation/hot water systems. Additionally, the QBP must meet the minimum energy reduction standards within the scope of ASHRAE 90.1-2007. These standards state that the QBP must be certified as being installed as part of plan designed to reduce the total energy and power costs by at least 50% in comparison to similar buildings. 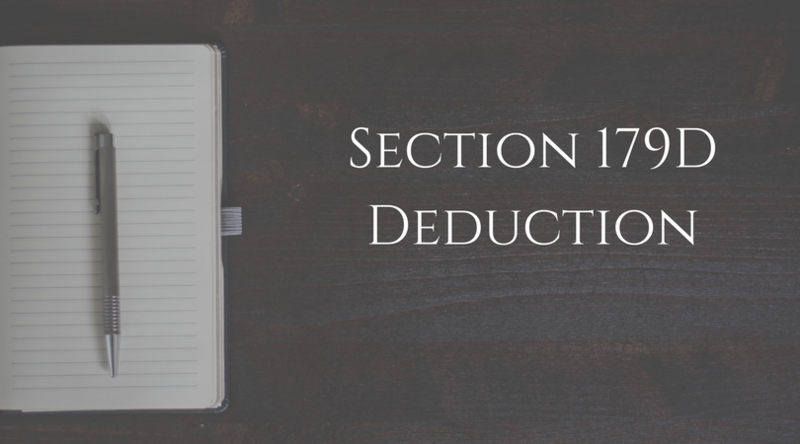 In general, the 179D deduction maxes out at $1.80 per square foot of the building space and can be deducted by the owner of the building (note that if it is owned by a Government entity, the deduction can be taken by the person responsible for the design). The deduction is looked at on a cumulative basis, meaning you can only take $1.80 per square foot of the building for all tax years. For example, if the building has 500 square feet of energy efficient improvements and you deducted 250 square feet in 2016, you can only deduct 250 square feet in 2017. Please note that once the deduction is determined, the building’s tax basis must be reduced by the 179D deduction claimed in a given tax year. If the ASHRAE standards mentioned above are not met, then, the deduction is decreased to $0.60 per square foot. Please note that there are “interim” rules for lighting systems that state that the lighting system power density must be reduced by 25% (50% for a warehouse). On top of this, if the reduction is only 40%, then only a percentage of the deduction is allowed. How Can I Calculate it Properly? In order to properly calculate the 179D deduction, it must be calculated using Qualified Computer Software (“QCS”). Per the IRS guidelines, QCS includes computer software with the below requirements. On top of this, the calculation must be done by an engineer or contractor who is 1) licensed in the jurisdiction where the property is located and 2) is unrelated to the party claiming the deduction. The 179D deduction was retroactively expired on December 31, 2016 but was recently extended through the end of 2017. As of today, it is uncertain if it will be available moving forward. If you are a business owner and you have made these types of upgrades to your building or have been thinking about upgrading your building with energy efficient features, please contact myself or your tax advisor to discuss how the deduction can be utilized.